Q From Clyde W Hathaway: How about dead as a doornail? A This is an ancient expression: we have a reference to this dating back to 1350, and it also appears in the fourteenth-century work The Vision of Piers Plowman and in Shakespeare’s Henry IV. Another expression, of rather later date, is as dead as a herring, because most people only saw herrings when they were long dead and preserved; there are other similes with the same meaning, such as dead as mutton, or dead as a stone. But why particularly a doornail, rather than just any old nail? Could it be because of the repetition of sounds, and the much better rhythm of the phrase compared with the version without door? Almost certainly the euphony has caused the phrase to survive longer than the alternatives I’ve quoted. But could there something special about a doornail? 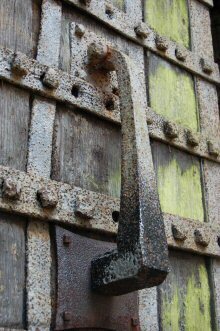 The usual reason given is that a doornail was one of the heavy studded nails on the outside of a medieval door, or possibly that the phrase refers to the particularly big one on which the knocker rested. A doornail, because of its size and probable antiquity, would seem dead enough for any proverb; the one on which the knocker sat might be thought particularly dead because of the number of times it had been knocked on the head. But William and Mary Morris, in The Morris Dictionary of Word and Phrase Origins, quote a correspondent who points out that it could come from a standard term in carpentry. If you hammer a nail through a piece of timber and then flatten the end over on the inside so it can’t be removed again (a technique called clinching), the nail is said to be dead, because you can’t use it again. Doornails would very probably have been subjected to this treatment to give extra strength in the years before screws were available. So they were dead because they’d been clinched. It sounds plausible, but whether it’s right or not we will probably never know. Last modified: 19 December 1998.